Pursuant to Sections 464, 465 and 466 of the Local Government Act we advise you that a public hearing will be held Thursday, August 16, 2018 at 6:30 pm at the Cedar Heritage Centre located at 1644 MacMillan Road, Nanaimo, concerning proposed "Regional District of Nanaimo Electoral Area &apos;A&apos; Official Community Plan Amendment Bylaw No. 1620.04, 2018" and "Regional District of Nanaimo Land Use and Subdivision Amendment Bylaw No. 500.419, 2018". 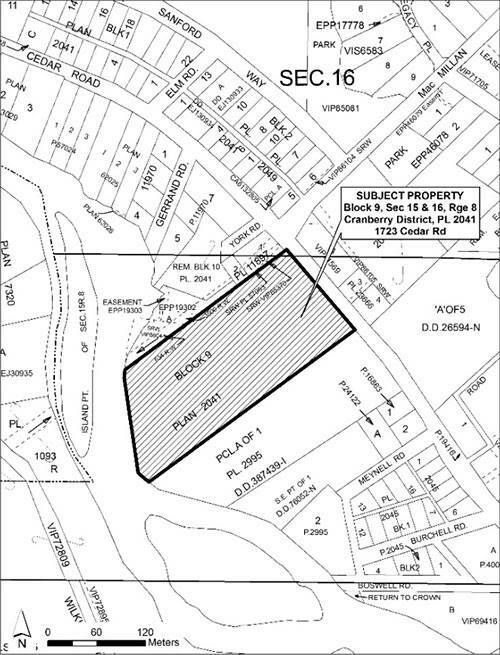 The proposed bylaw amendments affect the property located at 1723 Cedar Road in Electoral Area A, legally described as Block 9, Sections 15 and 16, Range 8, Cranberry District, Plan 2041 (see location map below). Re-designating the subject property from Residential to Community Services. Adding new exemptions from the Cedar Main Street Development Permit Area guidelines that apply to unattended and attended public utilities. The applicant also proposes to amend "Regional District of Nanaimo Land Use and Subdivision Bylaw No. 500, 1987" by rezoning the subject property from Residential 2 (RS2) to Public 1 Zone (PU1). The purpose of the proposed amendments is to allow the construction of a community water treatment facility and a potential site for the future construction of an administration building. A copy of the proposed bylaw and relevant documents may be inspected at the hearing or prior to the hearing until Thursday, August 16, 2018 at the Regional District of Nanaimo (RDN) office located at 6300 Hammond Bay Road, Nanaimo. Please contact the Planning Department Monday to Friday (excluding public holidays) 8:30 am to 4:30 pm, with extended business hours until 5:30 pm on Wednesdays. The public hearing will be chaired by Director McPherson or his alternate as a delegate of the Board. All persons who consider their interest in their property to be affected by the proposed bylaws shall be afforded an opportunity to be heard in person or by written submission at the public hearing. Written submissions can also be provided in advance of the public hearing and must be received at the RDN office by 4:30 pm Wednesday, August 15, 2018 to ensure their inclusion in the public record.